4.0.1 All sheep must be thoroughly inspected at least once per 24 hours. 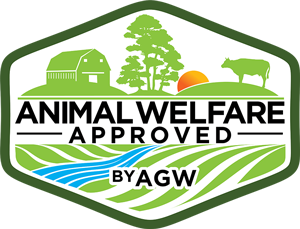 4.3.9 If welfare problems (including high mortality of lambs or ewes, high levels of assisted births, low body condition of lambs or ewes) result from the early age at which ewes lamb, then the Animal Welfare Approved program will require the farmer to increase the age at first lambing accordingly. 4.6.13 Weaning lambs in a meat sheep flock at less than three months of age is prohibited (see 4.6.16). 4.6.14 Lambs that are not yet weaned may be separated from their mothers at less than three months of age if they go direct to slaughter. 4.6.16 In exceptional circumstances when the health and welfare of the meat lamb, or the mother would otherwise be compromised, lambs may be weaned before three months of age. A record must be kept of each instance and the reasons for this early weaning. 6.1.1 To ensure proper rumen function sheep must be provided with at least 70 percent long fiber roughage/forage in their diet on a daily dry matter basis from weaning onwards. If the farm advertises that any of their animals produced are suitable as breeding, the farm is a breeding stock operation and must meet the standards below.